We come together in worship to celebrate, praise, and engage through word and scripture. 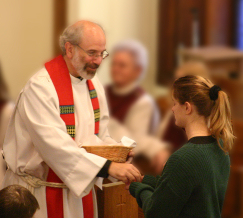 As Lutherans, we believe Jesus Christ is present through Word and Sacrament. We engage through interactive messages that include drama and dialogue. We praise God through song and pray as a community. All baptized Christians are welcome to join us at the Lord’s Table. As Lutherans we confess that Christ is truly present and that the gifts of this Sacrament are the forgiveness of sin and eternal life. Children are alway s welcome in worship at Good Shepherd. They are engaged in worship through children’s sermons and are an integral part of delivering the message at many services. 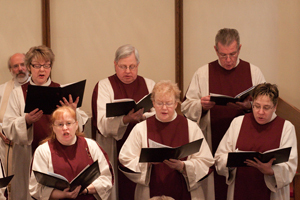 The chancel choir leads us in song at our 11:00 AM worship service September through June. Contact our Director of Music, Sandra Keator, if you are interested in sharing the gift of you voice. Please see our calendar for worship times. Enter your email address to receive new Faith Conversations and Ministry News directly to your inbox.